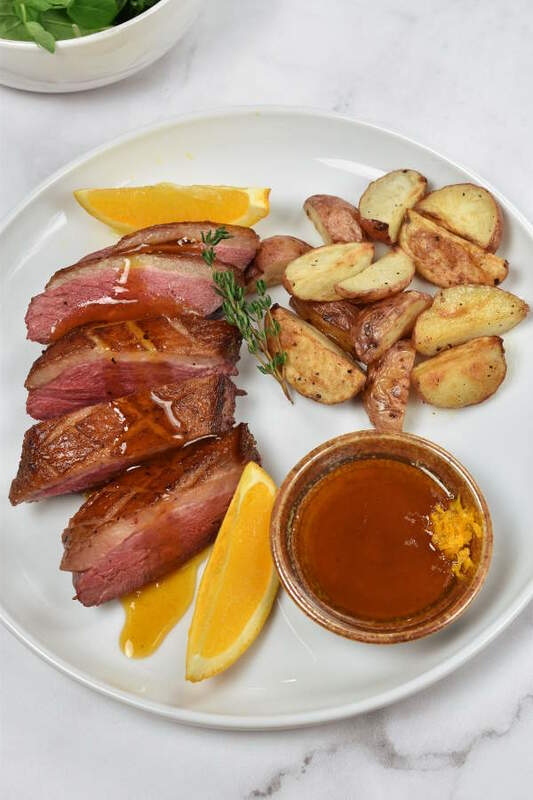 Duck a L’Orange or canard a l’orange is a classic French dish of roast duck served with an orange sauce. This variation, using a pan-seared Moulard duck breast, takes less than an hour to cook. The sweet orange sauce, flavored with orange liqueur and maple syrup, complements the fatty crispy duck. 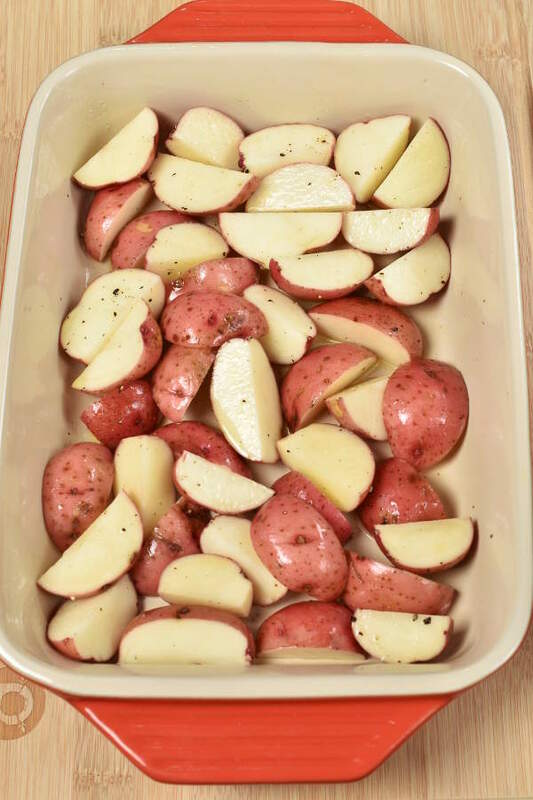 While you’re making the duck and the sauce on the stovetop, roast some potatoes in the oven for an easy hands-off side. I needed another excuse to make duck. 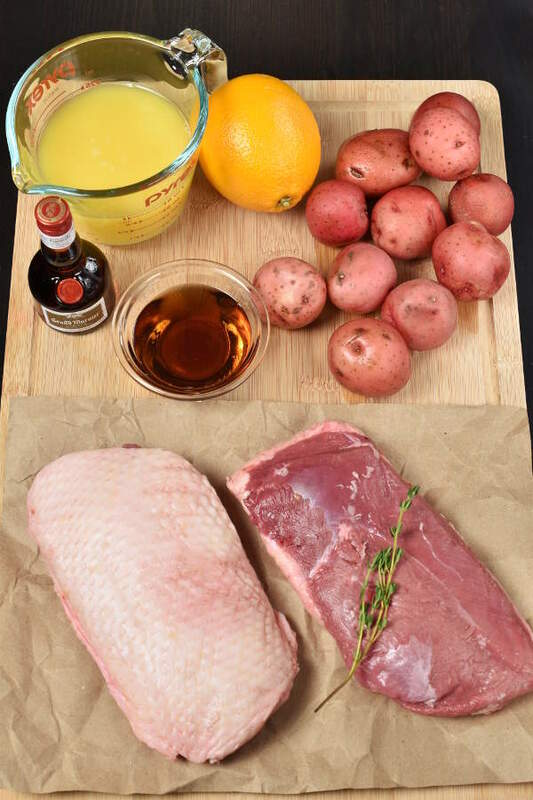 The very first recipe I shared on the blog, Duck Breast with Cherry Sauce and Duck Fat Fried Potatoes, is one of my favorite recipes. I’ve made it for company quite a few times, and I’d consider it one of my most impressive dishes. Most people don’t cook duck at home, and you don’t see it on many restaurant menus. But Moulard duck breasts, called magret in French, are such a treat, and fairly easy to cook. 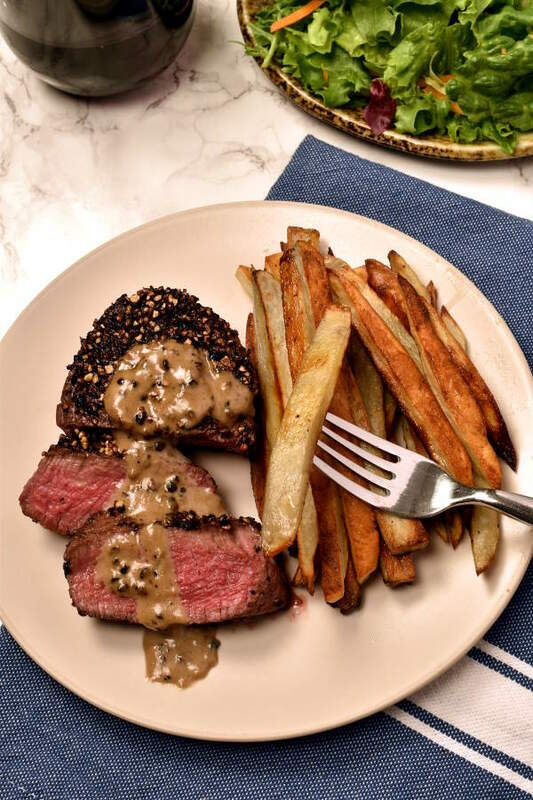 Cook them to medium-rare, like a steak, and you get this crispy fatty skin and tender flavorful meat. 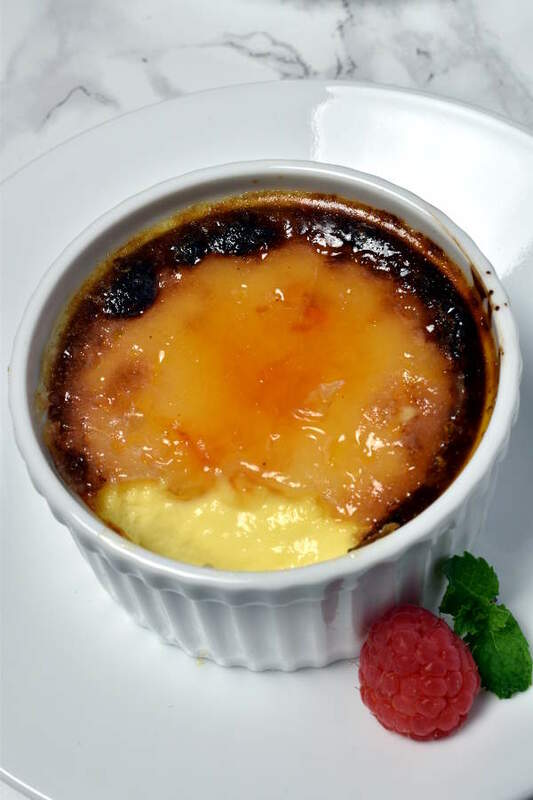 It’s so delicious with a fruit sauce. 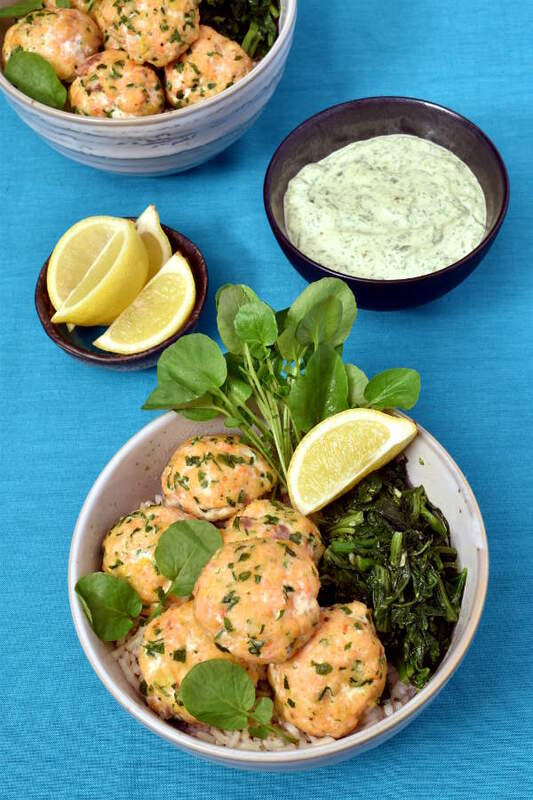 This is a knock-your-socks-off dish that doesn’t require hours in the kitchen. 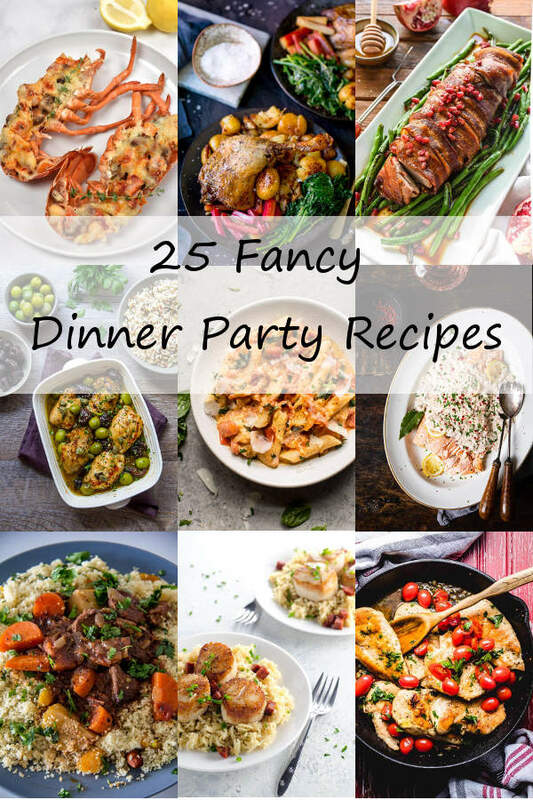 Perfect for date night or having company over around the holidays. 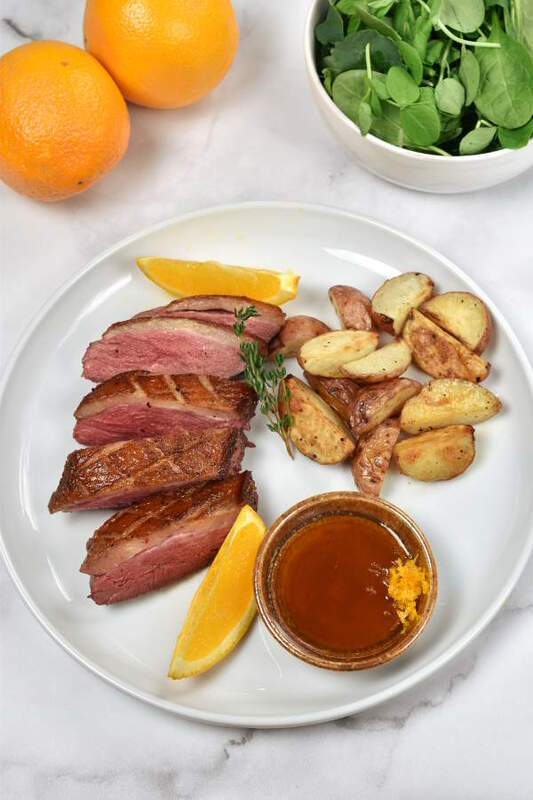 Especially as citrus comes into season in winter, you can get fancy using blood oranges or cara cara oranges to garnish your duck. So yes, there were several reasons I want to share another duck recipe. I wanted to try an orange sauce, for a faster easier take on duck a l’orange, which traditionally uses a whole duck. I also wanted to show you a few more photos of the recipe in progress than I included with my last duck recipe. Lastly, I wanted to give you another option for the potatoes. In my Duck Breast with Cherry Sauce recipe, I fried the potatoes in duck fat that was rendered from the skin as the duck was cooking. That is a great way to use up that duck fat and really adds something extra to the potatoes. That recipe, and the recipe I’m sharing today, both serve two. However, when I made duck for company, I tripled the recipe. I suddenly found myself with three skillets of duck on the stove to monitor and not a lot of extra time to be constantly stirring potatoes. So I decided to roast the potatoes in the oven. Then I had one less thing on the stovetop to worry about. 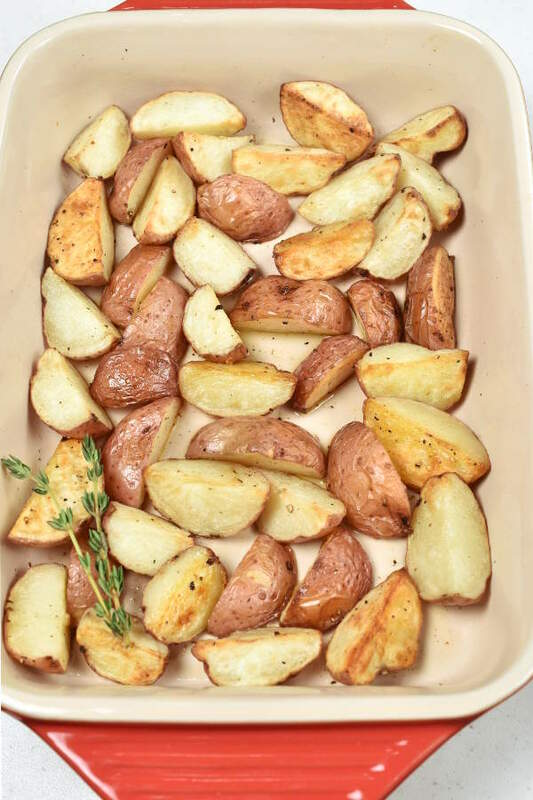 I wanted to share directions for oven roasting the potatoes to give you that option as well, especially if you are making this recipe for a crowd. Here are the main ingredients. Those are two pieces of Moulard duck breast (called magret in French). If you haven’t cooked duck before, check out this post where I wrote about the different types of duck sold in stores. 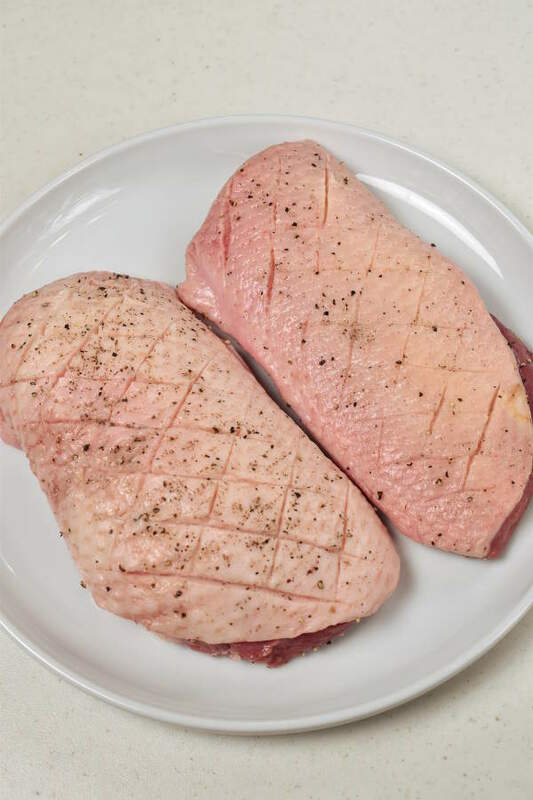 If you are using smaller duck breasts, you’ll definitely have to cut down the cook time to avoid overcooking. I roasted a pound of baby red potatoes. For the sauce, I used orange juice, chicken broth (not shown), maple syrup, and orange liqueur. The first step is to get the potatoes into the oven. Then I started the orange sauce. Reduce the sauce to about 1/3 cup. I seasoned the duck with salt and pepper and then scored the skin, which helps the fat render. Look at that delicious crispy skin. You can save the rendered duck fat in the fridge and use it in place of butter or oil for other recipes. I’ve been melting a spoonful in a skillet and using it to sauté spinach and other greens as a side dish. Here are the potatoes out of the oven. If you haven’t made duck yet, you really have to try it! Don’t be intimidated by making something new. If you have any questions at all, let me know in the comments. Spray a baking pan with cooking spray. Toss potatoes with salt and pepper and olive oil. Spread out onto the pan in a single layer. Bake for a total of 45 minutes*, or until potatoes are tender. 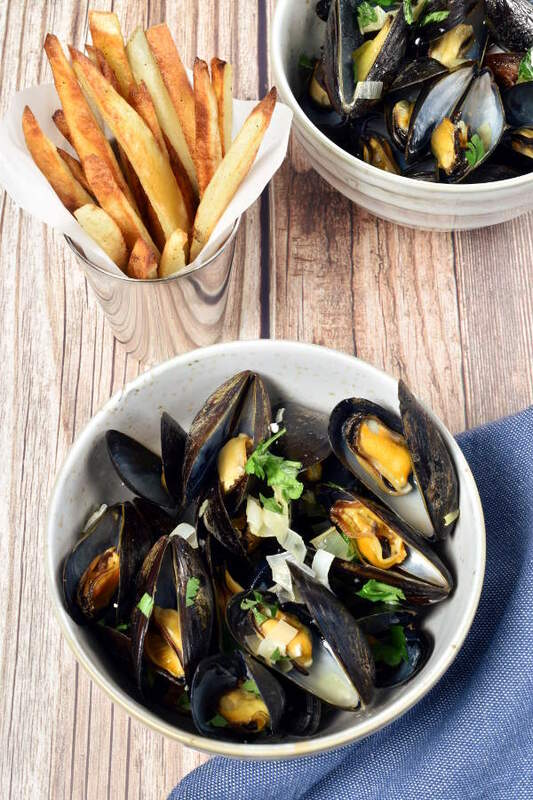 *At the 15-minute and 30-minute mark, remove pan from oven and stir the potatoes before putting back in oven. While potatoes are baking, make duck. Make sauce. 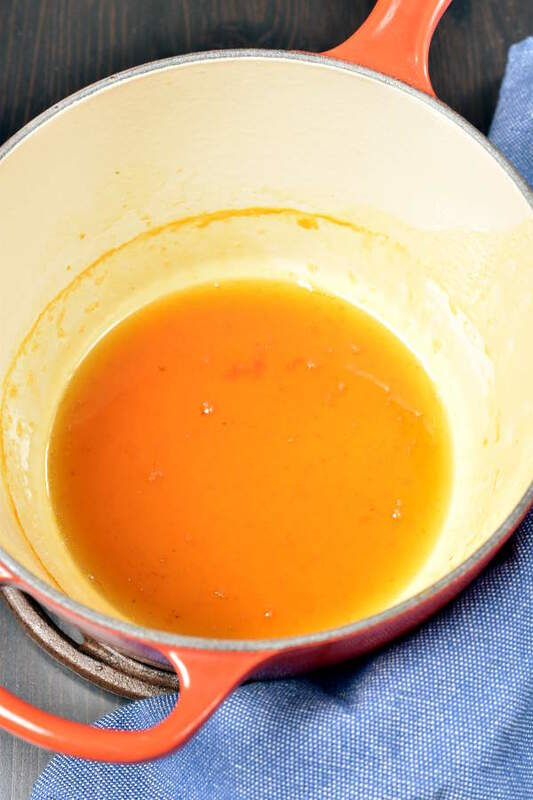 In a small saucepan, combine orange juice, broth, maple syrup, and liqueur. Bring to a boil over medium-high heat. Cook until sauce is reduced to roughly 1/3 cup, about 20 minutes. (While sauce is cooking, continue to next steps to make the duck.) Set aside until ready to serve. Prepare duck: Pat duck dry with paper towels. Season with salt and pepper on both sides. Run a knife diagonally over the skin to score it in a crisscross pattern, being careful not to cut all the way through the skin. This will help the fat render (meaning change from solid form to liquid form) as it cooks. 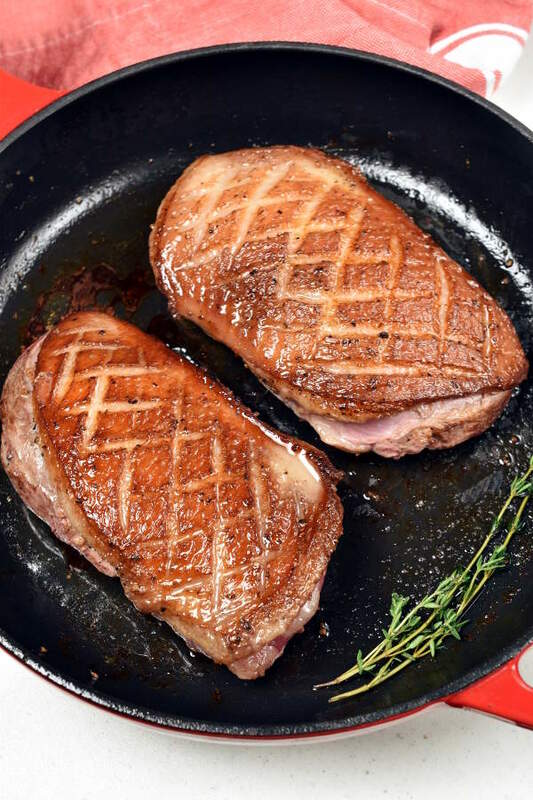 Cook duck: Heat a cast iron skillet over medium heat. Add duck, skin side down. Cook 8 minutes without moving. Pick up the skillet with one hand and use tongs or the back of a spoon with your other hand to hold the duck against the skillet. Carefully pour the melted duck fat out of the pan into a bowl. Put the skillet back on the stove. Turn heat down to medium-low. Continue cooking duck until the skin has rendered most of its fat and is crispy, another 5 to 10 minutes. Every few minutes, as liquid fat collects in the pan, pour it out into the bowl. When skin is crispy, flip the duck breasts over and cook for another 3 to 8 minutes, depending how you like it cooked. Remove duck to a plate and cover loosely with aluminum foil. Let rest for 10 minutes. If the sauce has cooled down, reheat over low heat while duck rests. To serve: Slice duck breasts against the grain. Plate duck and potatoes. Arrange orange sections around duck. Spoon sauce over duck and oranges. Garnish with orange zest and fresh thyme.